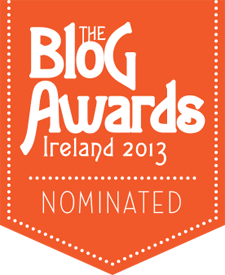 I got a very pleasant surprise yesterday to find out I’d been nominated for the Irish Blog Awards 2013. This was very unexpected and a wonderful lift to get at a time when much of what crosses my desk would not be of an inspirational nature. There are, unfortunately, a lot of people with myriad problems when it comes to property both home and abroad. It is particularly difficult when it is abroad, however, as there are added frustrations including added expenses, long distances, a language you may not understand and a culture that operates entirely differently to your own. Due to the nature of my business and my website I tend to hear from a lot of them. So with this in mind an email to tell me that I’d been nominated for the Irish Blog Awards 2013 was a wonderful lift to get. I’d very much like to thank my nominator (I presume somebody nominated me) and would also like to thank all those who have supported me and my efforts on the website over the years. The nomination for the Blog Awards 2013 is recognition of the effort that goes into running an entity that requires anything in the line of regular content. It can be quite a chore at times, so a recognition of the effort is greatly appreciated. I know somebody is going to point out that I’ve just been long-listed (as opposed to shortlisted) for the Irish Blog Awards 2013 at this stage, but that same is fine with me. If I make it further well and good, if not, it was great to be recognised even in a small way.